Need a DIY website builder with powerful, agency-grade customization options? Read our review of Webflow to find out if it’s the right pick for you. Webflow is a full-featured website builder whose mission is to “empower designers, creative professionals, and entrepreneurs to create for the web.” The company offers a variety of products designed to help people get up and running with a beautiful, fully-customized webpage without sacrificing flexibility or forcing users into molds created by pre-designed, static templates. How is the Customer Service and Technical Support? How do I Reach a Webflow Support Team Member? How Does Webflow Compare to Tools Like Wix, Weebly, or Squarespace? What framework does Webflow use? What technologies does Webflow use to boost page speed? Like most other website builders, the foundation of a Webflow site is a template. There are hundreds of professionally-designed templates from which you can choose. You can customize your selected template so that it’s perfect for your brand and goals. 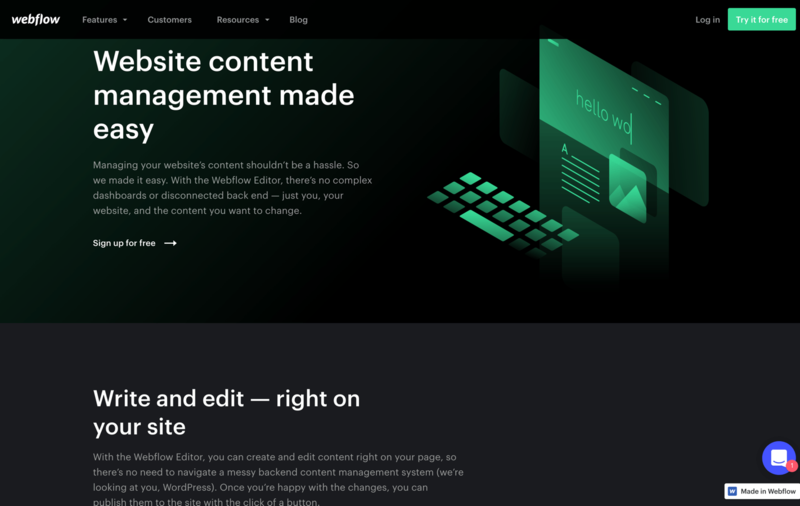 Webflow divides its template-editing/site-building features up into four basic categories: Designer, CMS, Hosting, and Editor. If you want to tweak the code itself, know that you’ll get all of the features included in CSS3 and HTML5, including support for the box model, 3D CSS transforms, custom transitions, floats, and flexboxes, and you can use the latest in typography, gradients, and DOM organization. Webflow is an unusual hybrid. It functions as an easy-to-use DIY site builder for those with no technical knowledge, and it markets itself as a superior alternative to WordPress. At the same time, it offers complex functionality to developers and designers and agencies are among its users. The latter note that the tool facilitates the dissolving of design-development silos — silos that often plague digital projects. Video above: Webflow offers many video tutorials on YouTube. Visit their “Webflow University” for more how-tos. With lots of functionality also comes a learning curve, but if you’re familiar with the Adobe product interface, you’ll feel at home. Webflow makes things easier for you to design by offering a library of pre-built, customizable components. Everything you create in the designer is, by default, responsive and compatible across all major browsers. 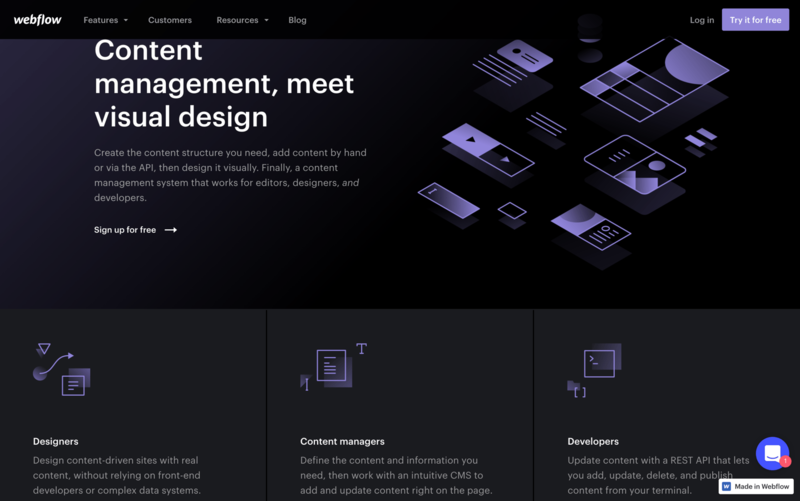 Webflow is a full content management system (CMS) a la Drupal, Magento, and WordPress in addition to being a powerful site designer and builder. You can easily create custom webhooks, import content from an existing database, or export content as JSON for use in native mobile apps. If you’re not a developer, then check out the many user-friendly zaps (integrations) available on Zapier.com. 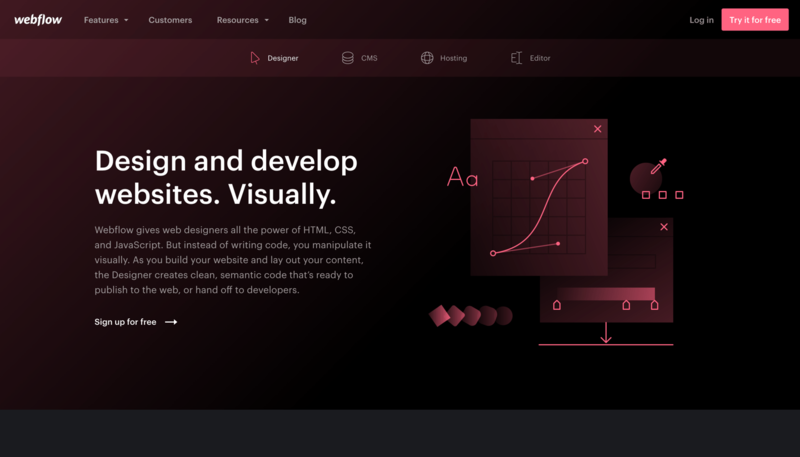 Webflow CMS, like its designer, is focused on flexibility and the ability. Create the content you need without being limited by templates, blog-centric content structures, or complex coding languages. What Webflow offers are schemas, which you can build and bind to the design that you want for your website. When working with content, you can use almost anything you can think of, including colors, images, text, and numbers, and because you likely have customer-centric data available, you can dynamically change your content so that your pages are customized based on the visitor. From the moment you go live, Webflow’s hosting technologies are ready to handle whatever traffic your site generates. Webflow’s “fleet” includes over 100 datacenters and servers worldwide, with content delivery networks (CDNs) powered by Fastly and Amazon CloudFront. You’ll also get SSL certificates, infrastructure that’s HTTP/2 compliant, and collaboration tools so that you can have your team members working on your site with you. Webflow claims that adding content is as easy as filling out a form, and whenever you’re ready to publish your changes, you can do so with just one click. Live preview means that you won’t see any surprises once your content has been published. Because Webflow separates content from the underlying support features, you can easily edit things without worrying about breaking any part of your site. You can also collaborate with your colleagues on anything you create, and detailed version history means that you know exactly who changed what and when. Optimizing your content for SEO can be done without any additional plugins. The ability to set your meta title and description are included directly in the editor, and you get instant previews of what your website’s entry will look like when its live on the internet. Webflow offers 25+ free templates to choose from, in addition to three wireframes. Whether you are looking to build an e-commerce site, a blog, or a basic portfolio site, there are plenty of templates to choose from. Each template gives information about what type of site it is best for. Nearly all the templates are responsive, so building a responsive website for mobile has never been easier. Picture yourself in business: Browse the Webflow site for samples of live sites using Webflow. This one is from a Canadian business that designs Webflow sites. You can, by browsing these sites, also get ideas of how you could market yourself as a Webflow professional. In addition to dozens of templates, Webflow also offers three wireframe options–Startup, Portfolio, and Business. Wireframes provide general outlines for your site and offer more customization options than templates. These are great options for the more design savvy but do not require coding knowledge. You can certainly use WebFlow for free for as long as you’d like, but your account will remain in trial status. You’ll get full design control and the ability to publish your site to a webflow.io subdomain, but you are limited to working on two projects. Once you’re ready to spring for a paid subscription, you can choose from any number of plans. You can pay for your plan on a month-to-month basis, or you can pay upfront for a year of service. If you opt for the latter option, you’ll receive a discount so that your monthly fees are less than what they would be if you paid monthly. If you decide that you want to cancel your account or hosting plan, you can do so at any time. Webflow does not offer refunds, and your plan will remain active until the end of your current billing period. If you’ve canceled a full account and you have one or more existing websites, your site won’t be deleted, and you won’t be “locked out” of your website — your account will simply downgrade to the free plan. When selecting a paid subscription, you can choose from options geared toward individuals needing just one site, designers, freelancers, or teams. 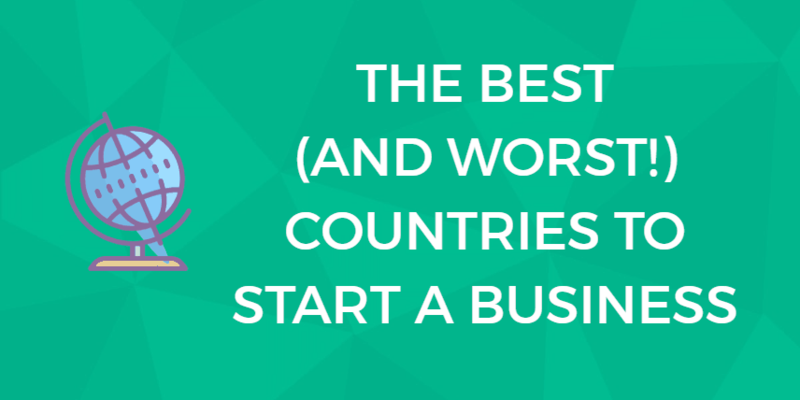 If you’re an individual who needs just one site, all you have to pay for is hosting. There are three different plans from which you can choose. They differ from one another based on the number of visitors allowed per month and the number of form submissions you can receive. However, note that the very basic, entry-level plan does not include any of the CMS or Editor features. If you’re someone who builds a lot of websites, you can use Webflow to help you craft your site. The basic package in this tier allows you to use the WebFlow tools to build sites, then bill your clients for the work you’ve done. The more expensive options, however, allow you to export your code for use in other environments. With any of these packages, you get all of Webflow’s features, as well as support for an unlimited number of projects. The options for teams are very similar to those available for designers and freelancers, but the teams’ plans include collaboration tools and, for those with large enough hosting packages, bulk pricing on web hosting. Webflow offers one of the most robust self-help sections we’ve seen from a website builder. In addition to Webflow University, where you can find curated lists of videos to watch (such as Intro to Design, Web Elements, or SEO Fundamentals), there are individual courses themselves where you can dive deeply into a specific topic. Current offerings include the Webflow 101 Crash Course and Ultimate Web Design Course. If digital (or online-based) learning isn’t really your cup of tea, download one of the e-books available to learn the same content. The Webflow Community is an open forum where you can crowdsource ideas and answers to your questions. If you want to get in touch with a Webflow staff member, you can do so Monday through Friday from 6 AM to 6 PM Pacific time (UTC-8) via the online contact form. Feature requests can be logged using the Webflow website’s Wishlist page. 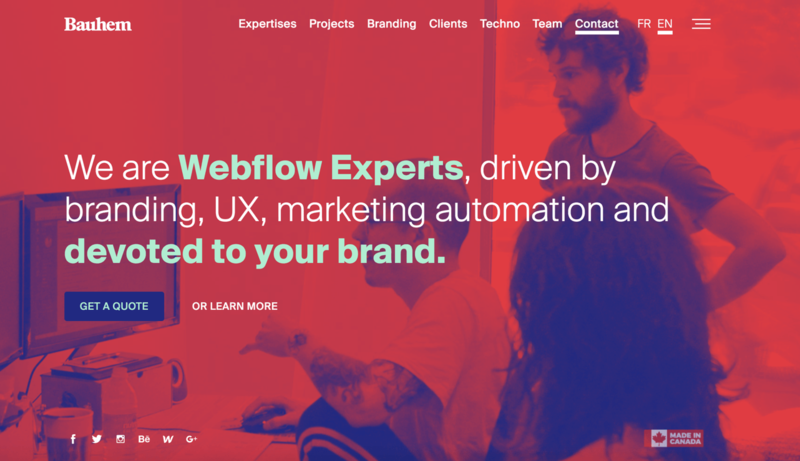 While Webflow doesn’t offer any type of consulting services, it does maintain a list of Webflow Experts that can help you get up and running. You can search for freelancers or agencies based on multiple types of criteria, including location, type of assistance provided, project type, size of the team, and so on. Because Webflow offers an SLA, you can check on the status of its systems at any time using its support website. Webflow is a full-featured website builder that offers an abundance of templates that you can fully customize. It is a powerful tool, which means there’s a learning curve to using its advanced features. 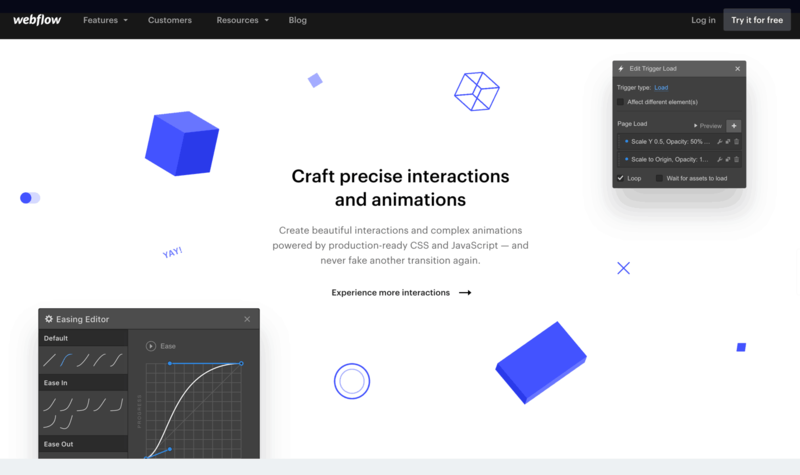 But Webflow, with its focus on customer experience and satisfaction, has provided many resources for its customers to use. On top of written documentation, Webflow provides in-depth video tutorials, including curated lists that walk you through the ones that would be most helpful for a given task. 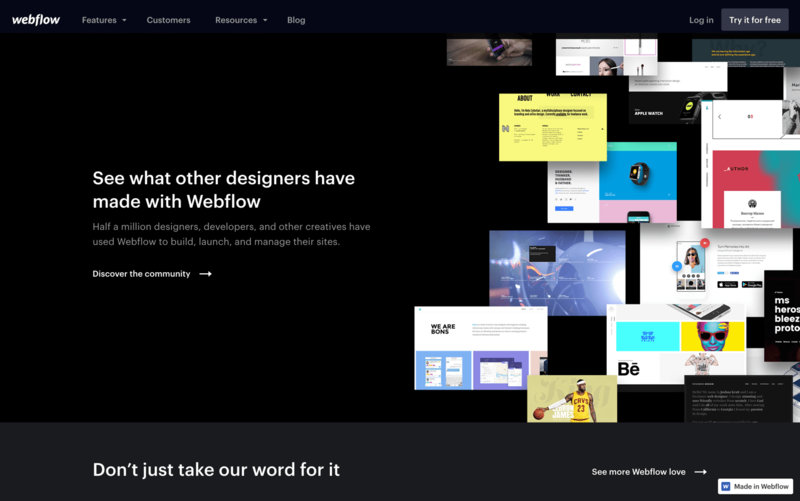 Unless you are interested in a full e-commerce builder (though it does look like many of those tools will be coming soon), Webflow is certainly a solid choice for those wanting a powerful yet accessible site builder. If you’ve got a question that’s not been answered in this review, contact us and we’ll find an answer for you! Webflow provides an easy to use and easy to customize drag-and-drop site building tool. Wix and Weebly tend to limit the number of customizations you can do — most site builders do, it is the trade-off for not having to code a site! Webflow offers one of the most customizable site builders on the market. Expect to spend some time figuring out how the builder works, but the reward will be a well-built, responsive website you can customize to your business’s needs without dropping thousands of dollars. Webflow uses its own proprietary framework. That may be important for you to know if you’re a diehard fan of frameworks like Bootstrap, Zurb Foundation, Materialize, Kurb, etc. Some Webflow users have incorporated Bootstrap: they report it’s doable but tricky. Webflow current uses the following technologies: OpenResty (which extends NGINX with Lua); Varnish, an impressive web application accelerator; the Amazon S3 CDN (content delivery network); NGINX; Amazon CloudFront; CDN JS; JQuery CDN; and UNPKG. You are here: Home > Website Builders: All The Top Builder Brands Ruthlessly Reviewed > Webflow Review: What Makes This Website Builder So Different? 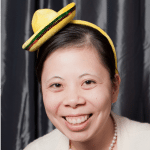 Previous: SiteZulu Review: Is This Site Builder Easy Enough for You to Use? Next: WebsiteBuilder: Over 10,000 Templates But Here’s The Truth About This Sitebuilder.